In the mid-1990s, when the low-fat diet was king, a young American obesity researcher began to have his doubts. He’s now authored a best-selling diet book promoting LCHF eating, and it’s a story that’s generating plenty of global headlines..
WHY, Dr David Ludwig wondered, did his patients almost invariably gain weight on state-of-the-art diets? Why was he himself gaining weight? Ludwig started spending his nights and weekends in the library, digging through long-forgotten studies and formulating a theory that some of the very foods diet experts were touting — bread, pasta, cereal — might prime the body for blood sugar swings, hunger pangs and fat storage. Then, he tried out his theories on his first human test subject: himself. “I started eating way more fat, cutting back on processed carbs. I ate a little bit more protein, but really made no attempt to lose weight,” he says. 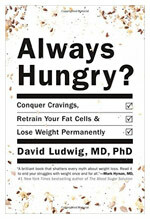 That experience put Ludwig, now a researcher at Boston Children’s Hospital and a professor at Harvard Medical School, on the long path to writing his new book, “Always Hungry? Conquer Cravings, Retrain your Fat Cells and Lose Weight Permanently,” an Amazon and Publisher’s Weekly best-seller. “The mantra is, forget calories, focus on food quality and let your body do the rest,” he says. There are no calorie restrictions in his eating plan, which includes fats such as nuts, full-fat dairy, and olive oil and dishes such as steak salad with blue cheese and coconut curry shrimp, as well as vegetarian alternatives. In the first stage of eating, you get about 50 percent of your calories from fat. Later that drops to 40 percent. The plan initially eliminates processed carbohydrates such as bread and pasta, then phases them in cautiously. “Our fat cells are triggered by (a) low-fat, highly processed carbohydrate diet, largely through raised insulin levels,” Ludwig said. When that happens, the brain puts out a call to eat something — preferably one of those highly processed starchy foods that will raise your blood sugar fast — and if you obey, the cycle starts again. Add to that that calorie restriction slows down your metabolism and makes you hungry, and, Ludwig says, and you start to see why so many diets eventually fail. Ludwig marshals an impressive array of studies to back his claims, including a high-profile 2012 Journal of the American Medical Association study he co-authored, in which dieters on a low-carb diet burned about 325 more calories a day than dieters on a low-fat diet. He also points to the remarkable PREDIMED study, published in 2013 in the New England Journal of Medicine. About 7,500 adults with heart disease risk factors were assigned to three diets: Mediterranean with lots of olive oil, Mediterranean with lots of nuts, or a low-fat. “They had to stop the study early because heart disease rates in the higher fat groups dropped so fast it would have been unethical to keep the control group eating the low-fat diet,” Ludwig says.